A Chinese employee works on the wing root of an aircraft at the assembly floor of the Airbus Tianjin plant in Tianjin on March 1, 2016. Air China, which is China's third largest carrier by passengers carried, on February 29 said it had ordered twelve Airbus A330-300 long-haul wide-bodied jets for US$2.9 billion. Europe's largest aircraft manufacturer Airbus started construction Wednesday on a new facility to deliver wide-body planes in China, as it faces off against bitter US rival Boeing for market share in the world's second-largest economy. At a ceremony in the northern port of Tianjin Airbus CEO Fabrice Bregier and Chinese officials officially broke ground for the completion and delivery centre that will produce two A330 planes per month. The centre is an expansion of the firm's existing final assembly plant for A320 single-aisle aircraft in the city. It comes with China's economic growth at its weakest in a quarter of a century and concerns over its outlook sending shivers through global stock exchanges. But Bregier said that “this is not true for our market”, adding that increased middle-class incomes and easing visa rules were driving a boom in Chinese air travel. The world's second-largest economy is already Asia's biggest aircraft buyer as a growing middle class takes to the skies in ever-increasing numbers. The country is forecast to have 1.7 billion air passengers by 2034, and is poised in the next two decades to become the largest civil aviation market in the world. The new US$150 million centre is the company's first such facility for wide-body aircraft outside Europe, and "marks a new milestone for Airbus' international footprint", Bregier said. It will take flyable unpainted aircraft from their headquarters in Toulouse, France and add cabins, furnishings and paint, before they are delivered to customers. Boeing also plans to open a completion centre in China, it announced last year. The company sold 300 aircraft worth a record US$38 billion during President Xi Jinping's visit to the US in 2015. The two firms have been in a fierce battle for market share in China, where Airbus says it has gone from 27 percent in 2004 -- before it opened the Tianjin final assembly line -- to roughly 50 percent today. The country is now Airbus' largest market, accounting for nearly a quarter of the planes it delivered in 2015. Days before the ground-breaking, Air China announced orders for 12 wide-body aircraft for US$2.9 billion. “I understand that our competitor is trying to mimic” the Airbus strategy by opening a facility, CEO Bregier said in Tianjin, but added: “It's not really state-of-the-art." A Boeing spokesman retorted: “Partnership is defined by more than a few buildings,” calling its relationships in the country “second to none” in supporting the development of Chinese aviation. Beijing has made building up its aerospace industry a strategic priority, considering it a crucial component of an advanced economy. Investing in new plants in China is not only a way to increase production, but also a way to win the approval of the government, which controls the airline industry. 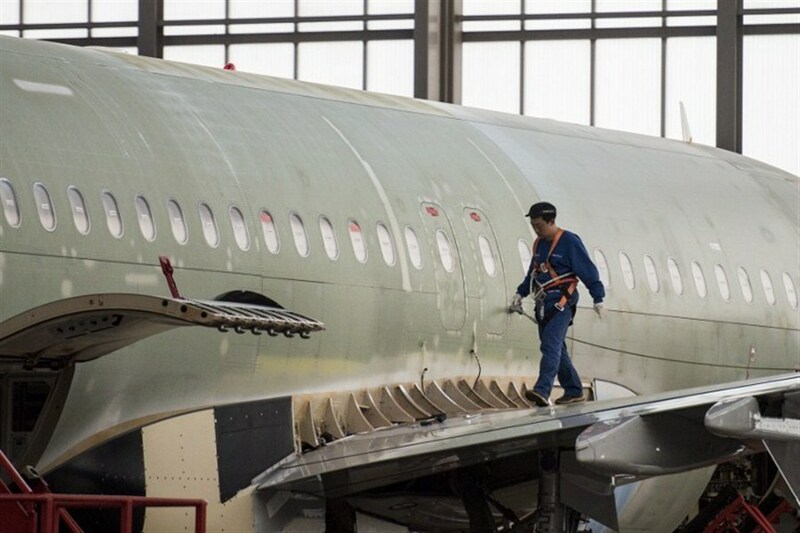 The Airbus A320 assembly plant is a joint venture in which Chinese stakeholders control 49 percent, and the European firm has joint operations with partners across China manufacturing doors, wings, and other parts for A320 family aircraft. For its part Boeing has joint ventures in Boeing Tianjin Composites and Boeing Shanghai Aviation Services as well as a manufacturing innovation centre. But even while it has encouraged partnerships with foreign firms the government is investing heavily in building up domestic champions such as state-owned Commercial Aircraft Corp. of China (COMAC). Airbus' Bregier acknowledged the threat of future Chinese competition, adding that co-operation only went so far.